The Chestburster punches through the host's sternum sending blood and fragments of bone everywhere during the opening the chest cavity, thereby killing its host. It has a long and slender body with small malproportioned limbs and an undeveloped head. The Chestburster moves by using its tail to push it along much like a serpent. 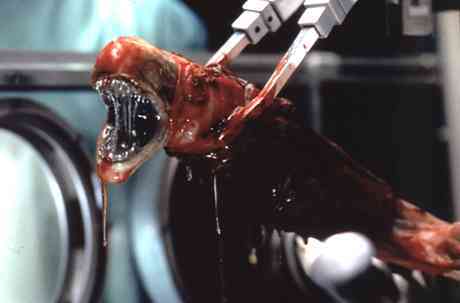 One of the first things a Chestburster will do is make its first use of its lungs by letting out a scream or cry. After it does this it will leave its host's body. Strangely enough, it appears that the Chestburster does not feed off the dead host's body. A factual reason for this behavior has yet to be determined. I speculate that the Alien instinctively flees the host on account of its vulnerable state, attempting to find a secure location in which to molt into the adult. 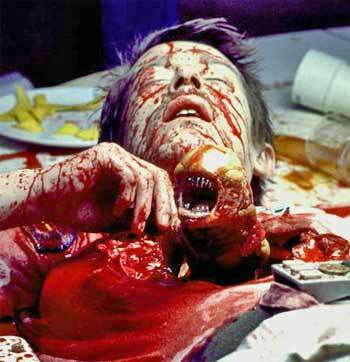 What the Chestburster eats during the maturation process is unknown. It is known that the Xenomorph will molt its shell numerous times in acheiving the size of a fully developed Alien. The chestburster has an astonishing metabolism rate that is significantly higher than at any other point in the life cycle. Based off of the avaliable information, it takes roughly two to three hours for the Alien to reach its full size, an estimated two meters in vertical height.